Kings Arms | Launceston Then! Mr King, clothier (father of Philip G King, who became 3rd Governor of New South Wales), of No. 5, Southgate Street, sold off his garden before disposing of his business; the garden became the site of a coaching inn, named ‘The King’s Arms’ to commemorate its previous inhabitants. Mr King made his will in May 1750, leaving all his property to named people; he died 1756 without mentioning any changes to the will. 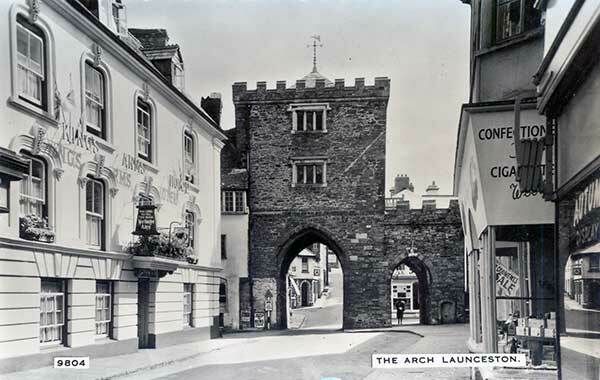 Originally known until 1758 as first The Plymouth Arms and then The Four Circles. The large stables had been built down the side at Blindhole at the same time. 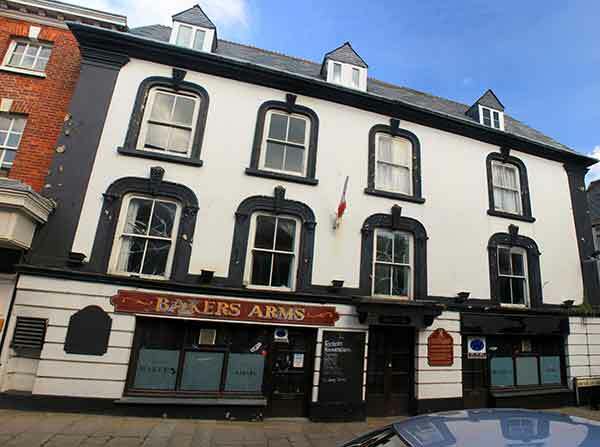 Richard Welsh was the first inn keeper who made his will in 1765, so leaving no time for name changing until modern times when it was purchased by Mr Baker who then changed the name to ‘The Baker’s Arms’. No other names have been added to that building. By his Will (probate 18 June, 1765) Richard Welsh, gentleman, gave a yearly rent charge of £5. 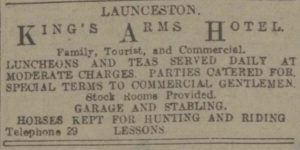 on his property at Launceston, called The King’s Arms, so that the income could be used to place out a poor girl at some trade or business. 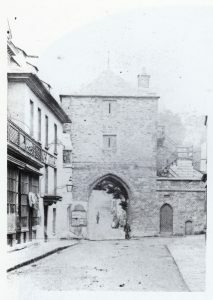 Eagle reported that payments had been neglected over a period of years when, in 1791, the Mayor obtained the arrears and had them invested in the security of the Launceston Turnpike. By 1836 the rent charge had been refused but an income was received from the £50 arrears, which had been invested. This was £2 a year in 1863 and is now just over that figure. A scheme for the Administration of this Charity was made by the Charity Commission on the 14th February, 1913. 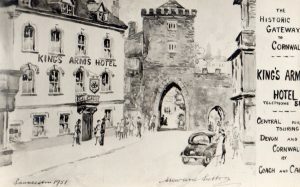 In 1783 William Palmer ‘of London’, built his ‘Hotel, Inn and Tavern’ on the Market Strand in Falmouth and in 1785 he moved to Launceston as Landlord of the King’s Arms. A Directory of 1823: W Smith, The King’s Arms Inn, Southgate Street. 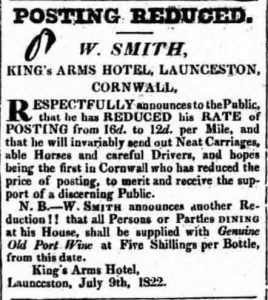 King Arms advert from 1822. In 1841, beside the South Gate, was Francis James, 39, innkeeper, of Boscastle, with wife Julia 39, daughter Mary 13, and son Richard aged 10, all born in Boscastle. The inn was known as The King’s Arms. In 1856 Thomas James was listed as the keeper of the King’s Arms in Southgate Street. He was killed by a lightning strike at Buenos Ayres, South America on September 16th, 1868, aged 56. 1860: Advertisement: West of England Brewery, Launceston. Mr J Shepherd offers India Pale Ale in 18 gallon casks, £1. 4s per cask. Guinness’s Stout in bottle, 5s per doz quarts. Champagne 42s, per doz bottles. Port Wines in draught, 12s per gallon. Sherry 12s per gallon. The King’s Arms’ passed from J. M, Facey to J. E. Parsons in November 1875. The Royal Mail coach ran from the James’ King’s Arms Launceston, leaving at 3.45 pm to arrive at Copplestone station in time for the 8.20 mail train to Exeter. Leaving London by evening Mail Train for Launceston via Copplestone, North Tawton, Okehampton, Bridestowe, Lew Down, and Lifton to arrive Launceston at 9.15 am. Fares 6s Outside, 9s Inside. Newspaper report dated 3rd June, 1880: The annual game dinner of the King’s Arms Hotel took place on Tuesday last, and was of a most excellent description the tables being choicely laid and supplied with game of every kind and the entrees fully up to Host Parsons’ standard. Owing to the severity of the weather and several unforeseen and unavoidable circumstances, the company was not so large as might have been expected, but it made up in sociability and conviviality what was wanting in numbers, under the genial presidency of Mr B. Parsons, in the absence of Philip Simcoe, Esq., who was prevented being present through a family bereavement. 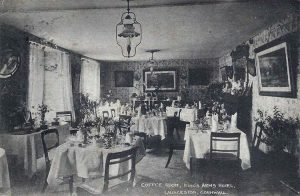 Various toasts were proposed, among others that of “The Town & Trade of Launceston”, and some practicable remarks were made thereon; “The Health of the Host and Hostess and Family” was drunk with enthusiasm, and their catering that evening, and on all occasions was the subject of general praises. Harmony and pleasant conversation filled in an enjoyable evening. 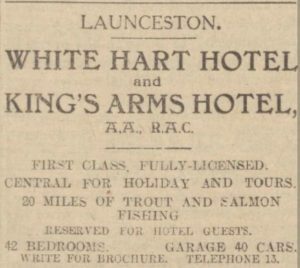 In September 1905, the King’s Arms, Southgate Street, Launceston, was put up for public auction by Mr Richard Peter, auctioneer, Westgate Street, and was purchased by Mr Cowlard, acting for Mr Deacon of Werrington Park. The bidding started at £1,000 by Mr Best, Mr Wevill bid £1,025, Mr Eggins £1,050, Mr Burt £1,100, and was finally sold on Mr Cowlard’s bid of £1,430. 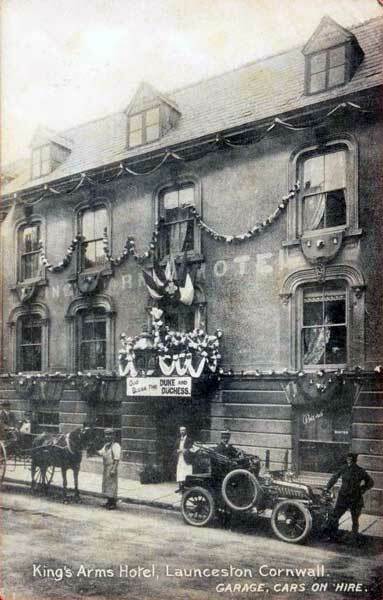 White Hart Hotel and Kings Arms advert from 1929. King Arms advert from 1929. Kings Arms Eurchre. 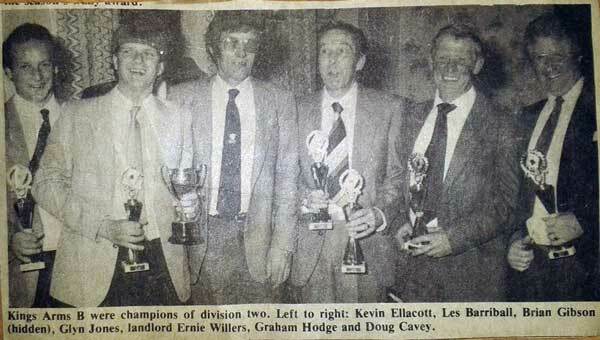 Photo courtesy of Les Barriball. The name was changed again in the late 1980’s to The Bakers Arms when under the ownership of the then White Hart owner, Mr. Brian Baker, but sadly hasn’t traded since November 2013 and has lain empty since. The Bakers Arms in 2014. The Southgate and Kings Arms from Southgate Street c.1870. Photo by Henry Hayman.